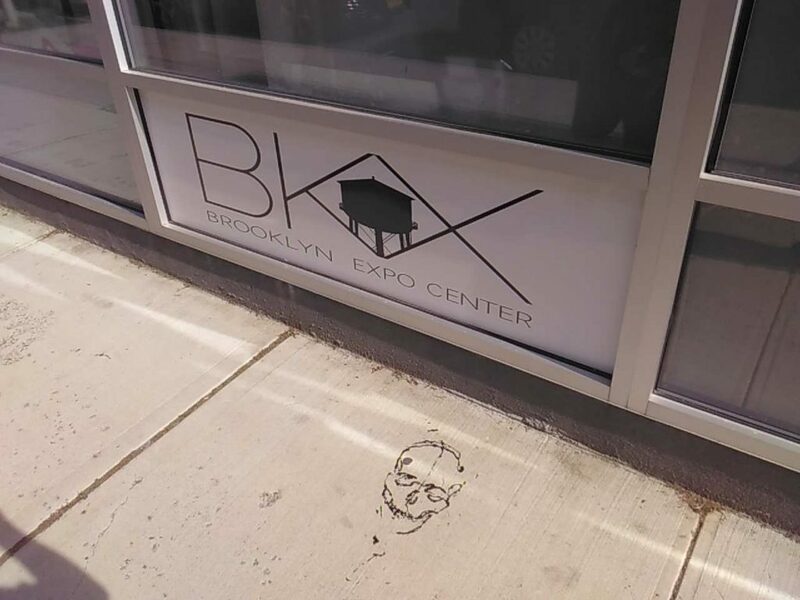 A fine doodle on the sidewalk by the Brooklyn Expo Center entrance. While it’s a basic tenant of the Pint that we deal in everything pop culture, there are areas that we are a bit remiss in. 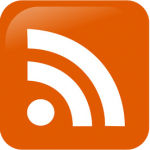 We know we’re a little lax in manga and anime coverage, and we know that we could do more in particular genres or interests that some of the readers or listeners have suggested. Every now and again, we are going to get caught up in a certain sub-culture that has been completely overlooked in one way or another. 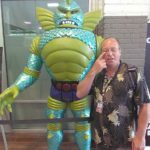 Tim Clarke, credited creator of the 80’s Sectaurs toy line, as well as the recurring Boglins hand puppet critter, recently appeared on an episode of the Pint O’ Comics radio show. He had informed me of his upcoming appearance through our emails at the Five Points Festival, a weekend event centered around toys, which he repeated on the program. Intrigued, I was able to secure a day to head down to the show, which was being held at the Brooklyn Expo Center, a still new-looking remodel of a much older building near the Greenpoint section of the fine Borough of Brooklyn. As none of the Six Pack was available to attend with me, I took old friend Notorious R.O.B. Fullam. Rob and I spent the day marveling at the wonders of the Five Point Festival, on a beautiful June Saturday. 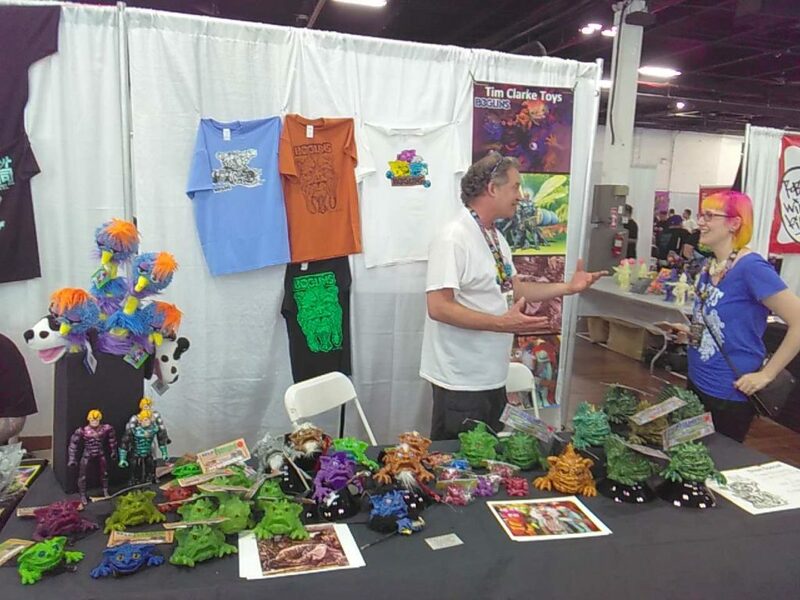 Tim Clarke with Sectaurs and Boglins. 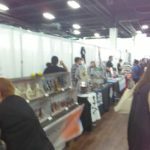 As always with shows I’ve never attended, there is that slight apprehension of what to expect, particularly when most of what is being exhibited is unknown. 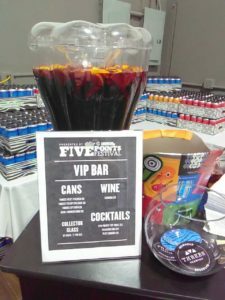 My greatest interest, to be honest, was the fact that Lagunitas Brewing was a sponsor, Six Point Brewery was unveiling a new beverage and an unknown (to me) Threes Brewing would be present as well. What a way to entice a Johnson (and a Rob)! We drove down to Brooklyn, got street parking and immediately got our badges all while marveling at the ease of it all. 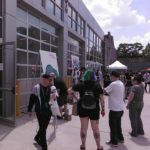 There was an impressive line at the door, but the Expo Center staff was able to handle it and be pleasant, even if it occasionally seemed they weren’t used to that size crowd. I generally like to walk the whole floor before getting into the thick of it, so Rob and I stalked about the square and easy to navigate structure, becoming more and more stricken with incredulity at a section of pop culture that neither of us were aware was so extremely large. 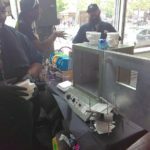 While toys are the core of Five Points Festival, it’s the “designer toys” that really hit home for the fans. 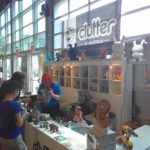 Everything from small figurines from Japan to rebooted lines long forgotten to groups teaching you how to mold and master your own creations were in attendance, by far superseding any prior thoughts of what the festival was about. 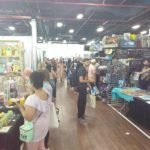 It was a complete cornucopia of creativity, as printers and comic book professionals and artists of every strange stripe lined the alleys. It fell to me, of course, to forget to stock my business cards before entering the building, so after a cursory walk around a couple of times, and sampling a fine pilsner from Threes Brewing, we returned to the Pint O’ Comics Trolley to retrieve said cards… and we went on a brief adventure. Brooklyn, for those that are unaware, has become quite the New Bohemia. It’s jammed with buildings that are from all sorts of architectural years, in which reside an astounding array of hipsters. With everything, including where we parked, so close to the Expo Center, we walked around the blocks a bit, enjoying the truly laid-back atmosphere, all while dodging joggers and searching for a bite to eat. We ended up at a park next to the East River, which seems to be getting cleaner by the day, depending where on it you are. All in all, a nice area to be in, with plenty of amenities. I’m guessing it’s nice, if you can afford it! 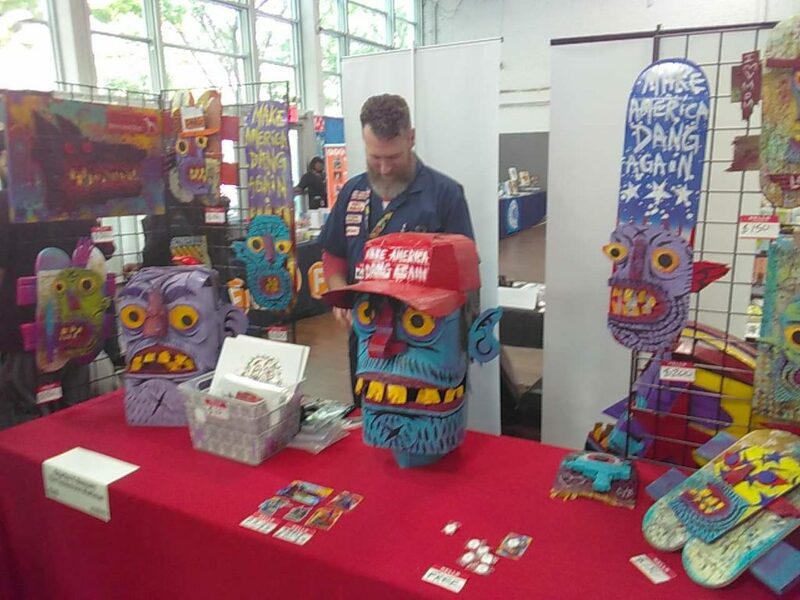 Returning to the Five Points Festival to really get our groove on, and laden with a fistful of cards, we dove in deep, talking with people from all parts of the world and exploring the things we didn’t know, as well as those we did. Rob took a shine to a line of openable figurines from Zazatoybox, a Japanese company with a couple of very friendly and approachable salesmen. I found some intriguing new comics from Matt Miner, current writer of GWAR at Dynamite, as well as one of the contributors to the current FUBAR collection of short stories. 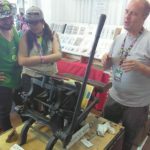 Later, Rob found a kindred spirit in the Sidekick Lab booth, where a tabletop, handcrank printing press was to be found in use. I struck up fun conversation with the creators of BLACK, a series from Black Mask Publishing I’ve mentioned on one of the audio programs before. 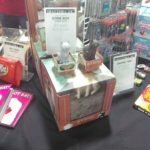 We were both pretty impressed with the Brutherford Industries booth, a place with a real ‘hands-on’ approach to selling not only their wares, but an educational platform in the creation process. As usual, there was a massive amount of fun and creativity to be had at this show, the second Five Points Festival. It’s a no-holds-barred exposition of expression and fun, generally aimed at the toy or figure collector, but there was, as was said often that day, “something for everyone”. Just look at my crappy dumbest smartphone pics to see. 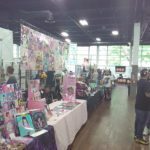 For newbies like me, who have little to no knowledge of this slice of fandom, the festival put together a great con booklet with specific descriptions and definitions of terms, which just added to my enjoyment of the show. 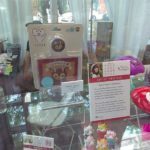 The hottest item at the show sold out before I got a pic! 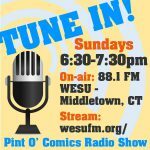 Five Points Festival is going on the list of Pint O’ Comics’ favored events. It’s easy to get to, it’s in a great area to visit, it has all the amenities needed for a show of this size, it’s got beer, the patrons are from all walks of life and wonderfully friendly, and you’re going to find something you like that you’ve never seen before. Don’t believe me? Just check out The Tennessee Wolfman. Charles V. Bennett, the Tennessee Wolfman! Find him on Instagram. 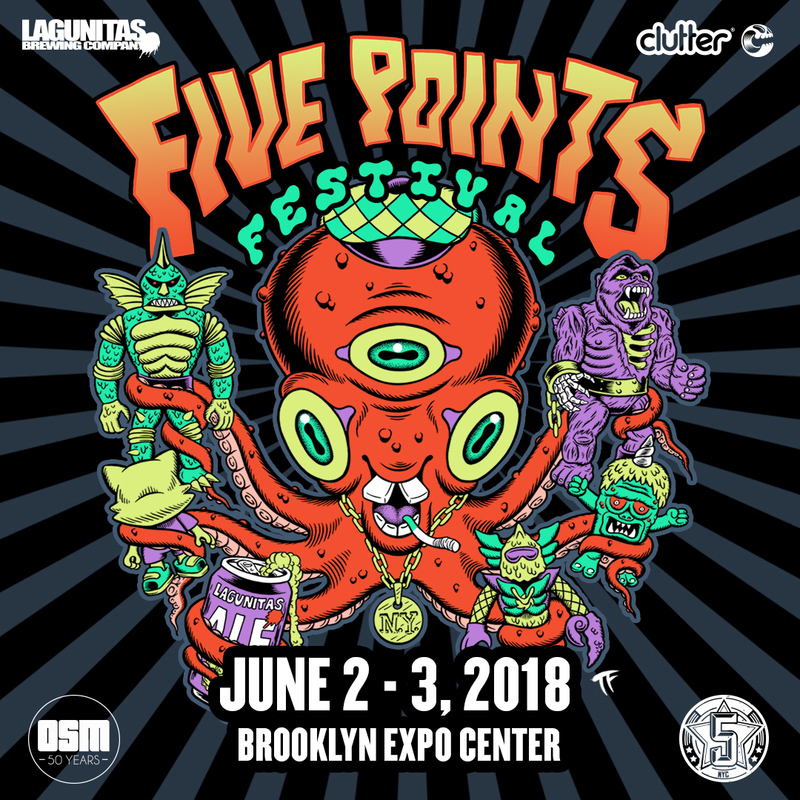 Five Points Festival 2018 was this past June 2-3. Check out their website for 2019 dates and links to all sorts of oddities!